Where do I find my presets (LR CC 1.3)? 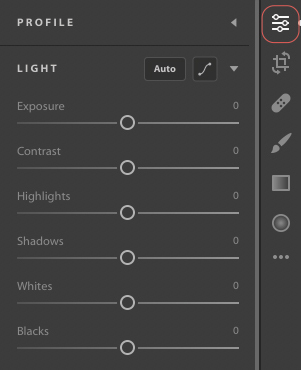 Note: The following instructions are for Lightroom CC 1.3 or higher. (2) Reveal your presets panel by clicking on the Presets tab at the bottom of the Edit control panel. 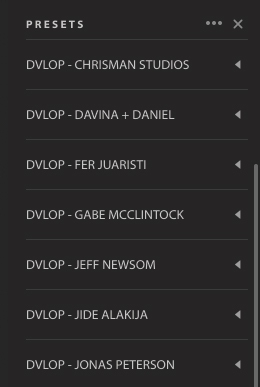 If you do not see your DVLOP presets here, you will need to import your presets. 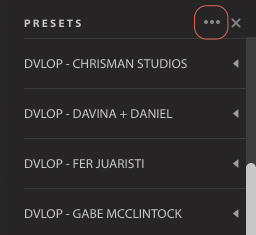 (1) In the Presets panel, click on the three dots icon and select Import Presets. Or from the top menu bar, File -> Import Profiles & Presets. 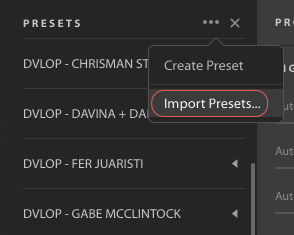 (2) Navigate to where your DVLOP presets are and click Import. Option 1 - If you have already installed the presets and know where they are located, navigate to the folder and click Import. Option 2 - If you cannot locate your presets, do a custom install of the presets and note where you installed then to. Navigate to that folder and Import. 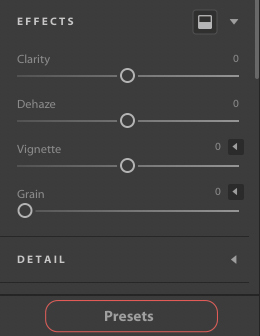 (3) Restart Lightroom CC for your presets to appear.